180 ml (for cats, kittens and puppies) and 270 ml (for dogs) polymeric bottles. The shampoo does not provide irritative and excessive deoiling skin effect. Soft shampoos contain aloe vera (wonderful natural component) which perfectly cleans, moisturizes and nutrifies hair, provides healthy look and lovely hair shine, strengthens hair roots and prevents fall-off, improves hair structure and promotes easy combing. Natural allantoin provides moisturizing and softening effect, stimulates healing of small fissures and wounds, promotes dandruff removal, abirritates and removes erythema. Provitamin B5 provides healing, moisturizing and sedative effects, increases strength of collagenic fibers, provides hair shine and moisturizing. Balanced shampoo formula is suitable for often use. It contains aloe vera and chitosan. Shampoo was specially developed on the base of natural ingredients for dogs with sensitive skin. Soft formula gently and softly cleans dirty skin and hair. Non-allergenic. Chitosan (natural conditioner) and aloe vera moisturize, nutrify and repair hair promoting easy combing. It contains aloe vera, chitosan and lanolin. 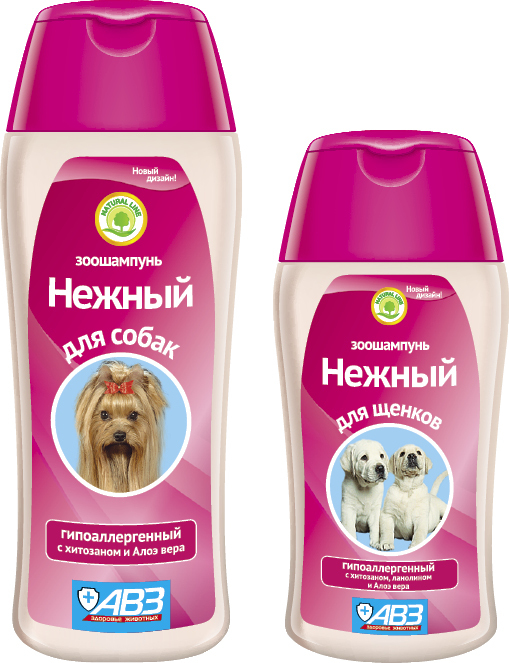 The shampoo was specially developed for puppies with sensitive and tender skin. Soft formula gently and softly cleans dirty skin and hair. Non-allergenic. Chitosan (natural conditioner), aloe vera and lanolin moisturize, nutrify and repair hair promoting easy combing. It contains chitosan and allantoin. The shampoo was specially developed for cats with sensitive skin. Soft formula gently and softly cleans dirty skin and hair. Non-allergenic. Chitosan (natural conditioner) and allantoin gently care about skin and hair, abirritate and provide easy combing. It contains chitosan and provitamin B5. The shampoo was specially developed for kittens with sensitive and tender skin. Soft formula gently and softly cleans dirty skin and hair. Non-allergenic. Chitosan (natural conditioner) and provitamin B5 moisturize and repair hair, provide hair shine and easy combing. Moisten animal hair with warm water, then apply appropriate amount of the shampoo and massage until foam appears. In 2-3 minutes freely wash it away with warm water. Repeat the procedure, if appropriate. Store in closed original package. Protect from light. Keep out of the reach of children and animals. Store separately from food and animal feeding at 0-25°С. Shelf life is 2 years from manufacturing date.